UN Secretary General Antonio Guterres has called for an independent probe into the death of 16 Gaza Palestinian killed by Israel defense forces (IDF) Friday as Palestinians marked the 42nd anniversary of the eviction of Palestinians from current Israel. The UN Chief demanded that the probe be independent and transparent following an emergency UN Security Council meeting called by Kuwait, Egypt after the death of 16 Palestinians in Gaza strip in a peaceful protest, taken by Israel as a cover-up to stage attacks in the territory. 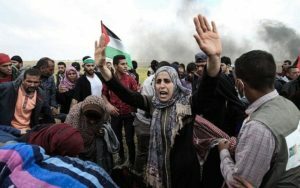 Around 30,000 Palestinians turned up at six points near the security fence between Israel and Gaza for weeks-long demonstrations to commemorate the 42nd anniversary of Israeli forces takeover of the Palestinian land in the buildup to the establishment of the state of Israel. Israel said Hamas instigated the protest movement and tried to exploit participants in it to deceive the international community in its attempts to hide its crimes. Over 1,400 protesters were wounded in the clashes with the Israeli forces, Hamas-ruled health ministry in the strip said, adding that close to 800 were hurt by live fire. Palestinian President Mahmoud Abbas based in the West Bank, condemned the killings and called on the UN to provide protection to “defenseless Palestinians”. “The large number of martyrs and injured in peaceful demonstrations affirms the need for the international community to intervene to provide protection for our people,” Abbas said in a televised address. The Palestinian leader declared Saturday “a day of national mourning”. Israel, ahead of protests, which also took place in the West Bank, deployed snipers, special forces and paramilitary border units to the border with the enclave. IDF said several of those killed in the clash were known as Hamas commandos and were aged between 18-30. Written by: KanelkaTagba on April 1, 2018. Posted by KanelkaTagba on Apr 1 2018. Filed under Headlines, World News. You can follow any responses to this entry through the RSS 2.0. Both comments and pings are currently closed.